The European Court of Human Rights has awarded a German citizen compensation after finding he was an innocent victim of extraordinary rendition by the CIA. It ordered Macedonia to pay Khaled al-Masri 60,000 euros (£48,000; $78,000) for arresting him and handing him over to the Americans in December 2003. He spent five months in secret CIA jails for suspected Islamist militants. The verdict is a major victory for Mr Masri who has struggled to clear his name in the US and Germany. Macedonia has said it will not comment until it is formally notified of the ruling, which was welcomed by human rights advocates. The court in Strasbourg found Macedonia responsible for the torture and degrading treatment of the plaintiff not only on Macedonian soil, but also in Afghanistan. 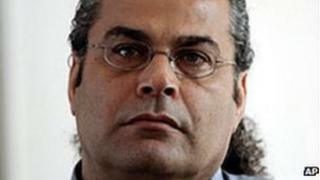 It found Mr Masri's account of his ordeal to have been established beyond reasonable doubt. The victim, a German citizen of Lebanese origin, was arrested, held in isolation, questioned and ill-treated in a hotel in the Macedonian capital Skopje for 23 days, the court's press service said. He was then transferred to CIA agents who brought him to a secret detention facility in Afghanistan, where he was further ill-treated for over four months. During the flight to Afghanistan, he was stripped, beaten, shackled, made to wear nappies and drugged, he says. His ordeal ended when he was eventually dumped on a road in Albania after the Americans realised they had got the wrong man. He attempted unsuccessfully to sue 13 CIA agents in US courts. An approach to the German authorities to request their extradition was dropped. Speaking to the BBC in 2007, he said he had been traumatised by the experience. In recent years, he was been involved in several violent incidents in Germany, receiving a suspended sentence for arson in 2007 and a two-year prison sentence for assaulting a town mayor in 2010. Currently still in prison, he is due for release early in the new year, a legal source told BBC News. James A Goldston, executive director of the Open Society Justice Initiative and lead lawyer for Mr Masri, greeted the verdict as a "personal victory" for his client. The victim had faced a "wall of silence in the United States and Europe about what happened to him for nine years", he said. "It is also the clearest possible indictment, by the world's leading human rights tribunal, of the illegal abuses associated with the CIA's post 9/11 campaign against al-Qaeda, and of European complicity in those abuses," he added. Amnesty International said the verdict was historic because "for the first time it holds a European state accountable for its involvement in the secret US-led programmes and is a milestone in the fight against impunity". "Macedonia is not alone," it said, in a joint statement with the International Committee of Jurists. "Many other European governments colluded with the USA to abduct, transfer, 'disappear' and torture people in the course of rendition operations. This judgment represents progress, but much more needs to be done to ensure accountability across Europe." The US authorities have long been accused of abducting and interrogating Islamist terror suspects without court sanction in the years since the 11 September attacks on America.